As seen In Carol Colemans Video. Basic Quick Connector Kits For 10 ft Long Low Tunnels. Works On 3', 4' or 6' Wide Hoops Made With 1/2" emt Tubing. Connector kit available for 1/2" or 3/4" emt tubing. 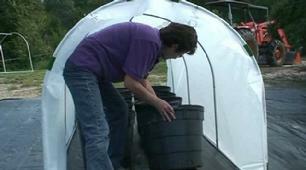 Build the portable Low Tunnel as seen built by Carol Coleman in the VIDEO. This kit contains 4 ea. perlin to hoop cross connectors, 8 ea. tee's for hoop to base connections and the self drilling screws required. For Hoops Made With 1/2" or 3/4" emt tubing . This kit will completely build one 10 ft. long Modular/ Portable Low Tunnel includes Dewitt 1/2 oz. Frost Covering And Snap Clamps, As seen in Carol Colemans VIDEO. Designed By Our Team Here At LCGS In Texas, For Eliot Coleman In Maine These Portable Modular Units Are The Best Solution For Gardeners In Ground Garden Needs. The first photo was taken at Eliot Colemans Farm in Maine, showing two of his students moving and setting up three of our modular design unit system over a newly planted garden section, producing a 12x 30 unit. The second photo shows two of these completed 30 ft units side by side with scissor door & poly covering snapped on. This connector kit can be used to build 6', 8', 10', or 12' wide round top hoop houses using 1" emt tubing . 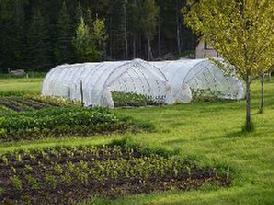 These hoop house units are designed to be 10 feet long so they are hand portable. 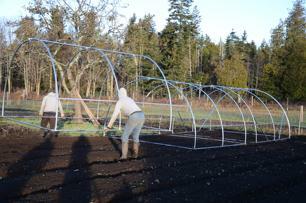 Units can be clamped together end to end using plain stainless steel hose clamped from any hardware store to create any length hoop house you want. Hoop Benders, Poly Covering and Snap Clamps Sold Separately.